I found these cute little Kraft caramel bits at Target, hope you guys can find them. They are so handy and so great in baking. Can’t wait to try them in brownies next. I love how after the cookies cool, the outside bits of caramel get a little crunchy. Yum, wait until you try these. 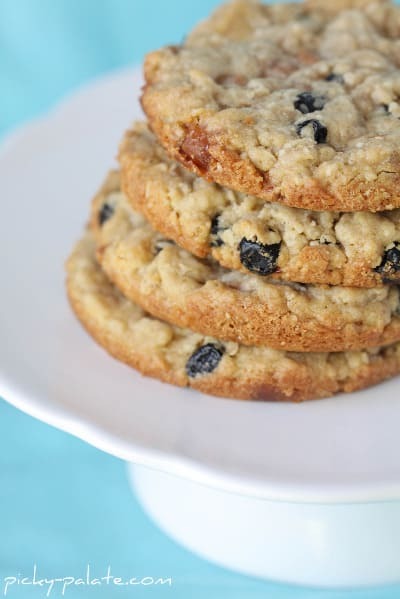 Break out your muffin top pans again folks, it’s time to make some cookies! Hard to see, but there are white chocolate chunks in the back of the bowl, love white chocolate in Oatmeal Cookies! You know a cookie will be good if you can’t stop eating the dough right? Well, I definitely couldn’t stop eating this! Y’all have your muffin top pans yet? Not sure how I lived without it! 1. 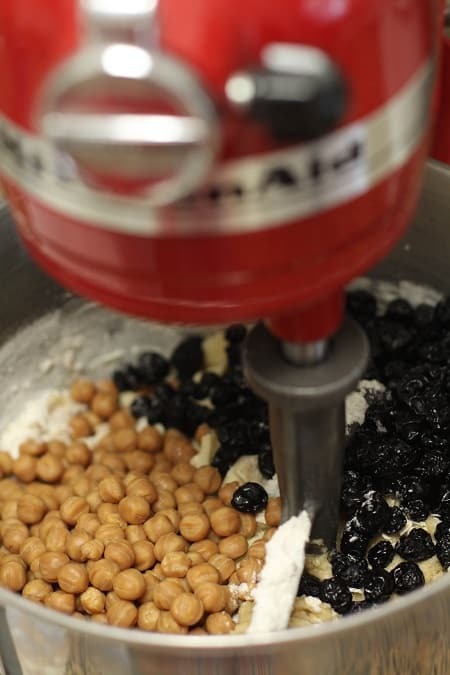 Preheat oven to 350 degrees F. In a stand mixer, beat the butter and sugars until light and fluffy. Beat in eggs and vanilla until well combined. 2. Place flour, oatmeal, baking soda and salt into a large bowl; mix to combine. 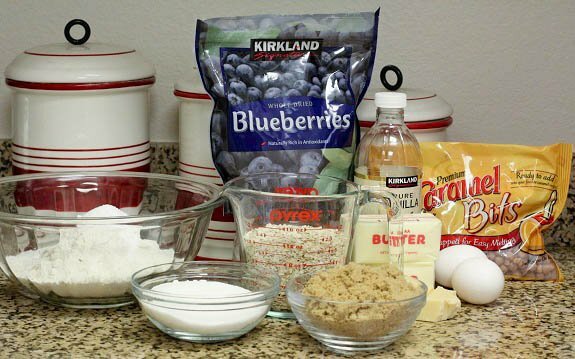 Add dry ingredients to wet ingredients along with the caramel bits, blueberries and white chocolate. Mix until just combined. 3. 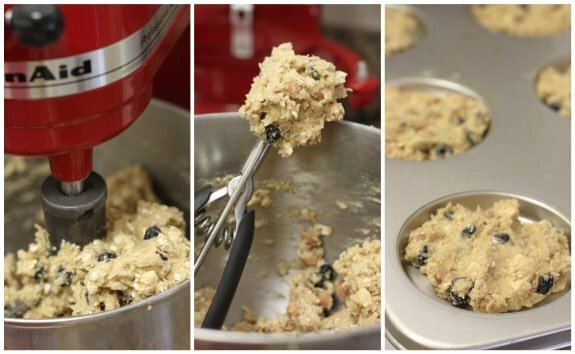 If using a muffin top pan, spray with cooking spray, scoop about 1/4 Cup dough into each muffin top pan cup, then press to about 1/2 inch thick. Bake for 11-14 minutes or until edges are just golden brown. If using a normal baking sheet. Use a medium cookie scoop and scoop dough onto a silpat or parchment lined baking sheet. Bake for 9-11 minutes or until edges are just turning golden brown. Remove and let cool for 5 minutes before removing from pan. Yummy looking cookies! Those caramel bits are cool, but they look like garbanzo beans, don’t they ;)? Those look amazing!! I’ve been hunting for those little caramels but I can’t seem to find them lately. I’ll just cut up regular caramels if I have to because I’m definitely trying these yummy cookies! 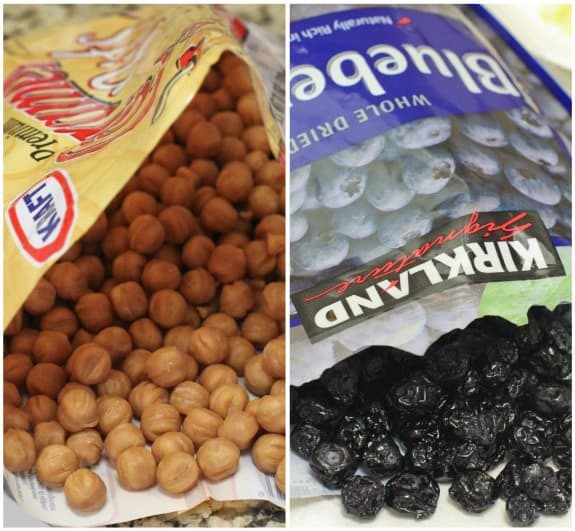 My husband and I have an obsession with dried blueberries… as in we can’t stop eating them! These sound amazing. You must be reading my mind…I was going to contact you about your muffin top pan, because I cannot find one in any local store. Thanks for the link! You’ve outdone yourself again – these look divine! 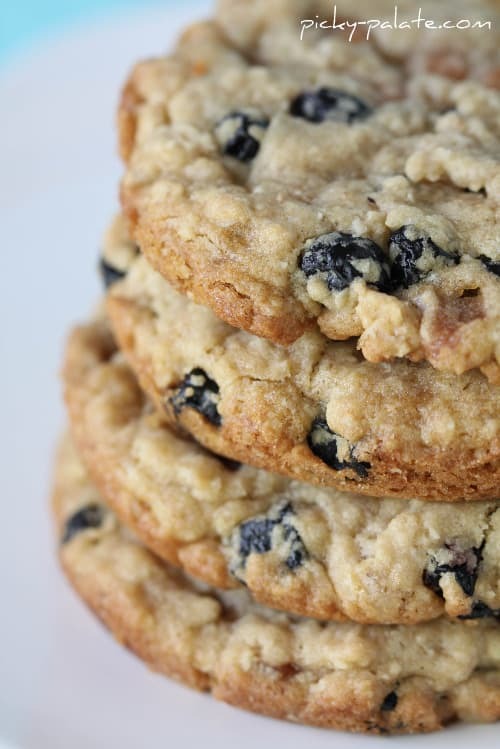 I am interested in making these cookies but I am unsure as to how much oatmeal to use. Also did you use quick oats? Just edited the recipe 🙂 Yes, I used quick oats. Lol! 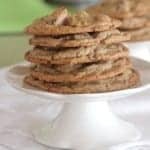 Just edited the recipe, what’s an oatmeal cookie without oatmeal?! Ok we need that muffin top pan, those caramel bits and those dried blueberries! Seriously – that combo looks completely amazing and delicious! I was waiting for these all weekend:) I love them! These looks divine! Both delicious and beautiful. OH these cookies sound so good! I’ve not tried dried blueberries yet! I just love the creations you dream up in the kitchen! These look like another winner. I have a hard time finding the caramel bits, but I’m going to keep looking! These are too cute! 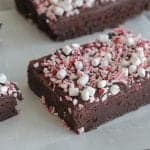 I would never have thought of this and I have to get a muffin top pan ASAP! These look so yummy! Cool idea, very unique. & those pictures left me craving some hot dogs & pizza!! Blueberries and caramel, who would’ve thought? I’ve seen those bits at Target, I need to pick some up! Ooooooh, I love those dried blueberries! Crack in a bag! I think I’ll be making these for our weekly family night tonight! Thanks! Oh my Sista! Those look and sound beyond DIVINE! I am so totally making these! THANKS! Love the cookie creation. I have to find those caramel bits at Target. They would be perfect for all the fall and holiday baking coming up. Whoa! Hello unique and delicious cookies 🙂 These have been bookmarked and will be made the next time I’m in a cookie mood! AMAZING! I had all the ingredients except for the caramel. I had to run to target anyway so I picked them up. I baked 1/4 in the muffin top tin (thx for the tip I haven’t used it in years and I LOVE the results) 1/4 on a slipmat and the remaining 1/2 went in the freezer so I can get a quick cookie fix as needed. These are really winners. I have been baking a lot of cookies lately and these are by far my favorite of the summer. Love the combo of ingredients that you chose. I’m hunting for those little caramel things asap! These sound great!!! I love love love the muffin top pan for cookies. I found a whoopie pie pan that works great too, slightly different shape. Made brownies this weekend with the caramel bits and white chocolate chips, super yummy. LOVE these! I haven’t yet used dried blueberries in baking and just had a ::smacks forehead:: doh! moment. 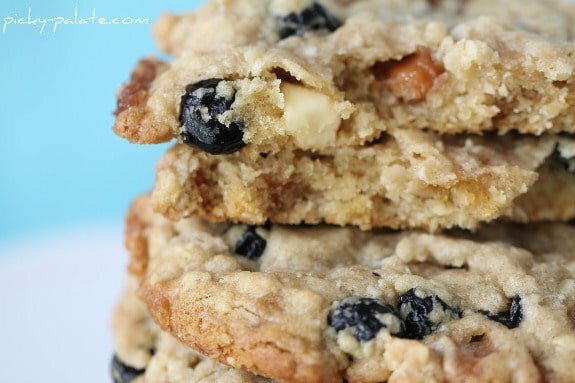 Love the combo of the blueberries, caramel and white chocolate. Sounds so delicious! You’ve done it again! I just drooled on the keyboard. These look seriously good. I’ve been eyeing all your muffin top cookies for a while now, and I think this one just sent me over the edge. Time to go dig around for my muffin top pan! Oh, and it looks like I’ll be making a trip to target today too. Thanks for the heads up! Hi, I do have that pan…two in fact and all because of your fabulous creations with it. BUT the one time I used it my brownies kinda stuck. They were a chore to get out and not all of them made it safely. 🙂 I generously sprayed the pan with Pam; soooooo have you had this issue before? Any suggestions? Should I let whatever I’ve baked in it cool completely before removing? Help?! These cookies are packed with many of my favorite flavors. This is such a great recipe! Yum! Wow, those look amazing. Now I know what to do with those dried blueberries I bought awhile back… they were not very good in muffins in my opinion. I will have to look for those yummy looking caramel bits… they look super good! I’m loving the caramel bits! I haven’t seen them around but next time I go to Target I’ll keep my eyes peeled. This is such a unique flavor combination. I hope I find the bits so I can try it out soon! So funny!! 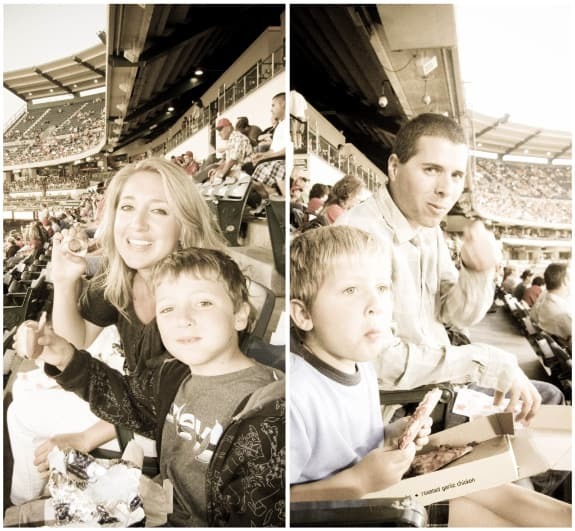 I was so excited to see what new posts you had up, and low and behold..there you are with your family at the Angels game–the exact same place that we were last Friday night!! What are the odds, right? It’s probably a good thing we didn’t see you, or I more than likely would’ve embarrassed myself by jumping up and down; wanting an autograph or something. 🙂 I’m a big fan of your blog! P.S. These cookies look amazing! Ok, I’m going to have to find those caramel bits! Those cookies look awesome! What a delicious cookie creation! I’ll have to keep an eye out for these caramel bits. It looks as though you were having a great time at the Angels game. I made these cookies today and they were YUMMY! I don’t have a muffin top pan, so I just used regular cookie sheets. I found that it made about 6 dozen cookies with the PC scoop that I use. Next time, I’ll definitely use parchment paper. The caramel bits melted to my sheets and made it a bit difficult to get them off the sheets. Everyone that I’ve shared the cookies with has LOVED them! Tried them with dried cranberries & they are delicious!! Made these tonight (regular sized) and they were delicious. 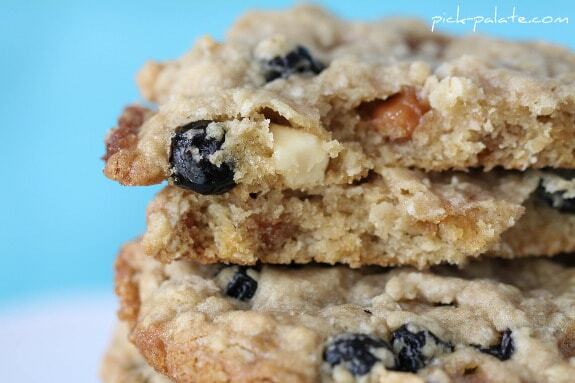 The blueberries and white chocolate is a perfect combo. I didn’t have the caramel bits so thought about doing browned butter but forgot. Nuts would be a yummy addition, too. Thanks for the recipe! This is the first recipe I’ve made from your website. They were wonderful! What a great combination of flavors. I especially loved the little caramel bits. I didn’t even know they existed until now. Yum!